January and February were supposed to be dedicated on a huge project that I am currently working on and although it has been keeping me very busy, some delays that were out of my hands have happened. That meant of course that I got some unexpected free time in the evenings and I couldn’t think of a better way to spend it than sewing. I decided to work on some projects that I really wanted to try out over the last few months and the rule that I made up was that they had to be patterns from somebody else, not from my own company. Otherwise, it would feel like working. Most of them were pretty easy makes, too. Things that I could finish in a day or two, nothing too complicated and stressful. 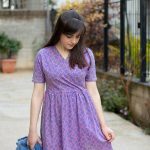 The first pattern that I cut out was a Thea dress from Sew Over It. They released this pattern back in December and at first I didn’t really like the versions I saw. However, Lisa posted a grey, shorter version on her IG a few days later and she looked very stylish, so I snapped the pattern up during their sale and decided to give it a go. 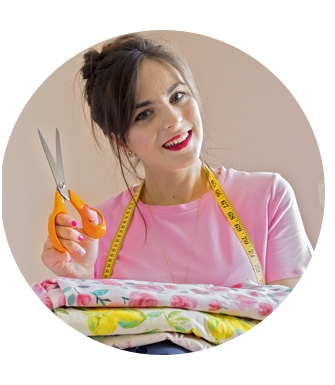 If you’ve been following me for a while or if you just go and look back at my older posts, you’ll see that I used to be a HUGE Sew Over It fan. The minute a pattern was launched, I had it in my basket and I believe I own almost everything they have in their range. Well, at least until last year. I don’t know why, but their 2018 patterns haven’t been that appealing to me. And I noticed on FB groups that many other people feel the same. 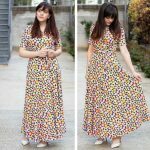 Maybe it’s because I tried a couple of them (the Lottie –full pattern review here– and the Marguerite dresses) back in the summer and I had so many issues with the fit. The back neckline was huge on me on both patterns and I had to figure out a way to salvage those garments. I used to fit in their patterns straight out of the box, so I guess I was a bit thrown off by that change in the drafting, which seems to be a common issue for lots of other people as well. Anyway, as I said I still got a few of their patterns over the sales and I also used a credit code I had for their store after pattern tetsing for them once. So I had a good bunch of new patterns to try out. I opted for the Thea dress first because I was looking for an easy-to-throw-on-in-the-morning dress that would keep me warm. In regards to my fabric choice, I used a navy blue Ponte Roma from Girl Charlee, which was very kindly gifted to me last year. 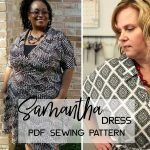 I have used this same fabric many times in the past (see my knit Kimberly dress and my Abi jumpsuit) and I was very satisfied with the quality, so I knew it was going to be a good fit for this dress. The construction of the Thea dress was very straightforward. I chose my usual size 10 for SOI patterns, according to my measurements. I was a bit naughty and didn’t stabilize the neckline, as suggested in the instructions, because I didn’t have any stay tape on hand. 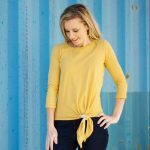 I really liked the way the neckline was finished with the topstitching along the shoulder seams and overall it was an easy make. However, the dress turned out HUGE. When I first put it on, I looked like a sack of potatoes. 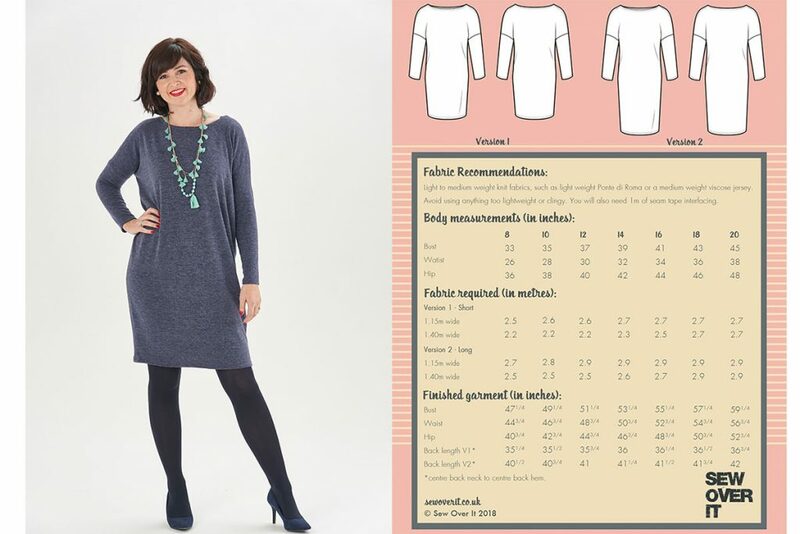 I was expecting it to be quite slouchy and oversized because this is the style of this cocoon dress, but the end result was very unflattering. But I didn’t want to give up and decided to take it in. I didn’t have to unpick the seams because the side seams are sewn in one continuous seam from the sleeve hem down to the dress hem. The first time I took it in by 2 cm but it wasn’t enough. After trying it on again, I repeated the same process, removing another 2 cm from each side. After that adjustment, it feels much much better and I actually really enjoy wearing it. It’s very comfortable and quite chic, if I say so myself. It looks quite good without a belt, although it is still slouchy and oversized, but I usually wear prefer wearing it belted. Overall, I am quite happy with this dress. I’m not sure if I’ll ever make it again and if I do, I will make sure to adjust the pattern pieces first to avoid all this extra hustle of taking it in. It is a good pattern to try out if you like cocoon style dresses, but be aware that it has a relaxed fit. Let me know if you’ve tried this pattern and what were your thoughts on it. I’d love to hear!